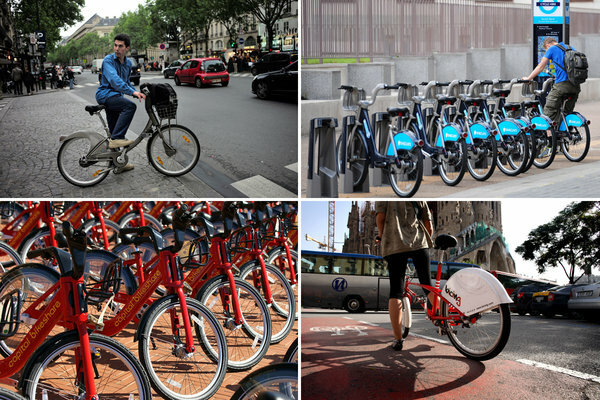 Clockwise from top left, bike-share systems in Paris, London, Barcelona and Washington. New York has studied the experiences in other cities for its program. There is a hopeful prediction, kicking around in cycling circles as New York City’s bike-share program nears its introduction to a skeptical public: Soon enough, the thinking goes, the scheme will prove so popular that New Yorkers will insist they invented it. When Citi Bike is introduced in New York on Monday, it will resemble a sort of cycling stew — bulky bikes to match the behemoths of London, a pricing model that resembles Washington’s and pliable station hardware borrowed from Montreal. And when Citi Bike personnel “rebalance” the supply of bikes by truck, they will be emulating cities like Paris, where rental riders’ joy in gliding downhill has not been matched by their determination in pedaling back up. The process began as early as 2009, amid Mayor Michael R. Bloomberg’s expansion of bike lanes, as city officials wondered if a bike-share system might also suit the streets. The administration compiled a report studying programs from five cities — Barcelona, Montreal, Paris, Toulouse and Washington — weighing how characteristics of each might translate in New York. Paris seemed immediately like the best comparison, given its size, tourism and widely used mass transit network. The population density of New York’s busiest hubs, like Manhattan and western Brooklyn, was virtually identical to Paris’s, officials noted. But despite the popularity of the program, which includes 24,000 bikes — quadruple the size of New York’s initial system — Paris also supplied crucial lessons in what not to do. In the early days of the rental system, known as Vélib’, an estimated 80 percent of the program’s original bikes were stolen or damaged, often landing on the black markets of Eastern Europe and North Africa. The city later reinforced the bikes’ chains and baskets and added better theft protection, but vandalism “is still a problem,” said Albert Asséraf, vice president of strategy, research and marketing at JCDecaux, which oversees the program in Paris. With this in mind, New York’s bikes will be locked into stations at the steering port, rather than on the side of the bike frame — the configuration that has allowed Parisian thieves to “use the bike as a lever” to crack it out of the lock, Mr. Orcutt said. The bikes themselves, and the process of paying for them, are more direct descendants of the London program. Relying on a leading sponsor — Barclays for London, Citibank for New York — whose logo is splashed across the program equipment, the cities have opted for hulking bikes to negotiate the high-traffic streets. The safety trends in London, and in other bike-share cities like Washington and Minneapolis, may portend well for New York, where many residents have questioned the wisdom of introducing thousands of new bikes to the road. Officials from all three cities said no fatalities had been reported among the programs’ riders since they began operating. In New York, the Bloomberg administration has resisted calls, most notably from John C. Liu, the city comptroller, to mandate helmet use — in part, officials said, because of cycling trends observed in other cities. A program in Melbourne, where helmets are required, struggled to attract riders because of the restriction. Officials in Mexico City and Tel Aviv repealed helmet laws before introducing their bike-share systems, hoping to drive up memberships. Another frequent criticism of New York’s program — that the bike kiosks are intrusive additions to already-clogged streets and sidewalks — was most likely dulled, at least somewhat, by New York’s attention to its forebears. In London and Paris, stations are trenched in the ground, rendering them difficult to remove. Kiosks in New York’s system, similar to Montreal’s, are simply set on the street surface, secured by their own weight, with no physical tethering to the ground. “Can you imagine doing 300 miniconstruction sites around the city?” Mr. Orcutt said, alluding to the resident complaints about even the low-maintenance installation. The flexibility has already allowed the city to adjust kiosks, as workers did recently on Bank Street, where a few spots were removed to avoid blocking a building entrance. Still, administrators from other programs suggested that New York’s system would not be without its birth pangs. Jenna Oxley, a spokeswoman for the London program, said many riders struggled initially with simple tasks, like checking a bike into and out of a kiosk. Critics in Washington have accused the program there of becoming a subsidy for white residents and the highly educated, two groups disproportionally represented among members. In Minneapolis, a largely car-dependent public needed to be convinced that bike sharing was not “a crazy socialist notion,” said Bill Dossett, the executive director for Nice Ride Minnesota, which operates from April to November. The study cites cycling’s health benefits, the promise of job creation and the idea that it would burnish New York’s “image as a ‘green’ leader.” It also highlighted an ambition that seems to have infused the bike share program’s rise: Mr. Bloomberg’s vision of New York as a global city, with transportation to match. Citing the “tangible positive image benefits in Paris,” the report concluded its pitch for bike share with a line from a 2007 newspaper article about that city’s latest addition.